for all you guys who have read my blog for a while you probably know that my love for Ariana grande is very strong. 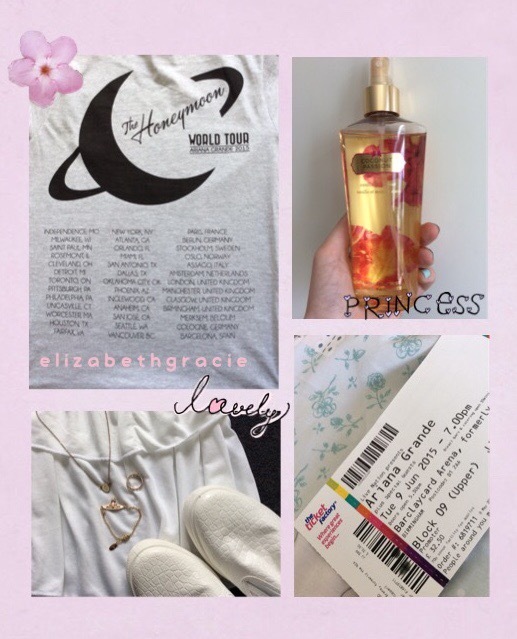 I have been a fan – little elephant/ arianator if you want- since 2011. Last night the one thing I thought would never happen did. I saw Ariana grande in concert. You might think I’m going over the top but you guys have no idea how much this means to me. It means a lot. I can’t explain how much. As soon as she stepped on stage, I cried because I was so happy. From the merch stand I got this t shirt which is so cute! It has the logo of the tour small on the front. I can’t wait to wear it! It was £25 which is the usual price for a tour t shirt. Once I sort out the photos I can add some into this post. I also had a lot of videos. I actually used 5gb just on her concert. But it was so worth it. I danced, sang and screamed my way through the night. Ariana sung songs from her old album yours truly and her new album my everything and a few very old songs that aren’t on either of them. Overall it was great being a room full of people who loved Ariana nearly as much as I do!